Recommended Name: � the Cádiz pattern. This pattern was originally classified as S-1.14. Together with other designs derived from the National (S-1.1) at the time when it was produced mainly in Andalucia, it has been referred to as of "Andalucianquot; or "Southern" style. As a pattern in its own right, "Cádiz" (its precise place of origin) is recommended as the appropriate name. When the Real Fabrica's export monopoly, based at Macharaviaya (province of Malaga), came to an end in 1811, independent cardmakers saw an opportunity to exploit remaining markets abroad. Those in Cádiz became particularly active, and their version of the National pattern took on characteristics which became distinctive. These characteristics are found in early examples by L. Marchand (1812) and Mariano Mafei (c.1818) and fully established in those of C. Somariva (1842) and J. Acuaviva (1848). As it was the export market that provided these maritime manufacturers with their main incentive, their designs became much more familiar outside Spain than within. Mexico was the main target and there in particular the Cádiz strain came to be an accepted Standard. 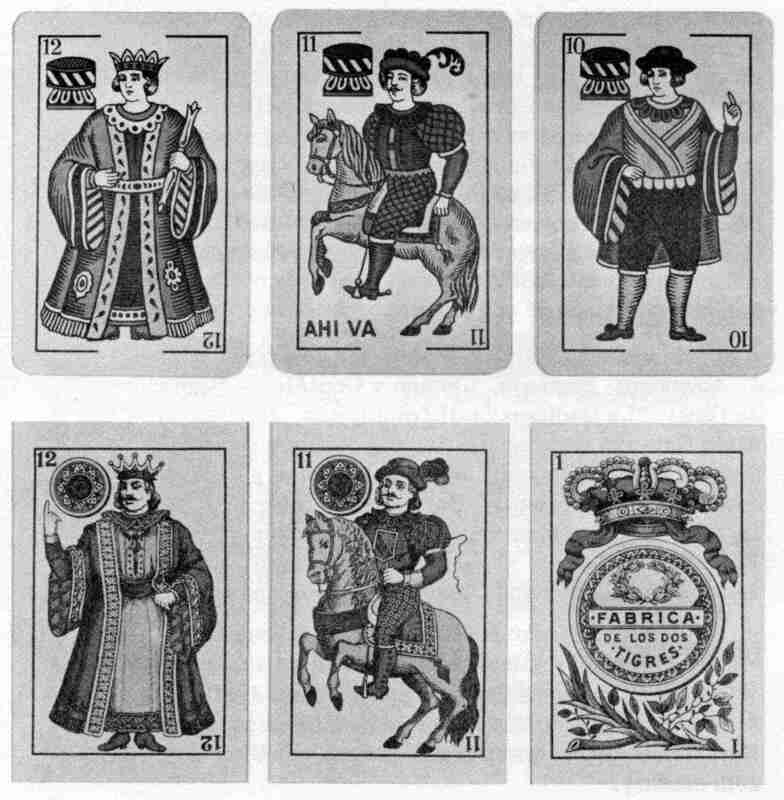 When, in the early 20th century, Spanish card manufacture shifted from Andalucia, the design continued to be made and exported by Barcelona firms, as it now is by Fournier of Vitoria. Moreover, ever since the pattern became familiar in Mexico it has regularly been made there too. It is also used in Central America and the Philippines. Not now used in Spain. Archaic, straight-sided cups as in the National pattern; court cards of the batons suit wield clubs often shaped as in that design too. Kings and cavaliers usually wear moustaches; kings' feet visible below robes. 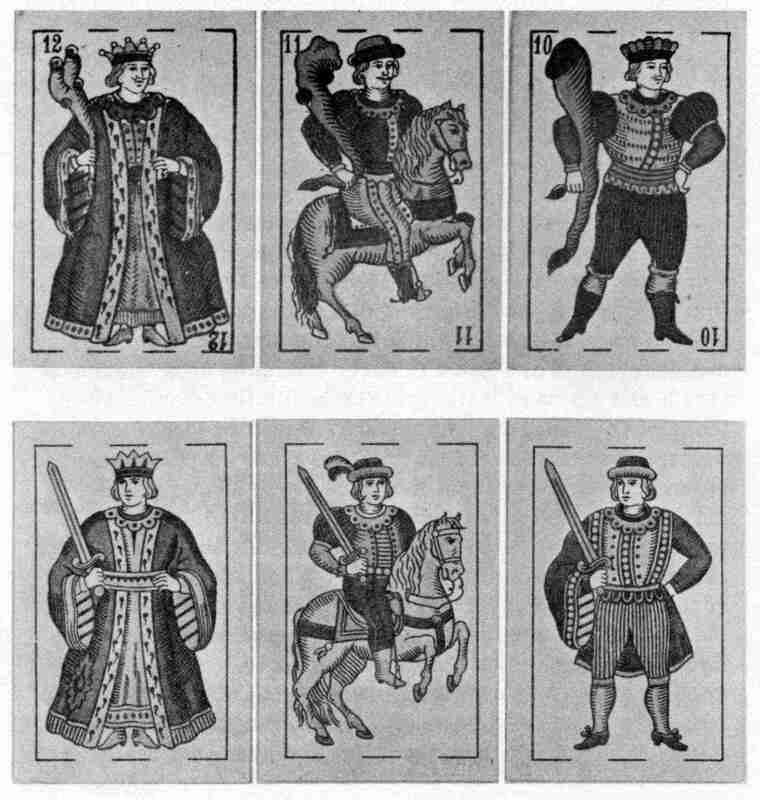 All cavaliers and jacks wear knee-breeches, several quilted; waist-length tunics, most with balloon-like upper sleeves, also quilted. "AHIVA" (or similar) commonly appears on the cavalier of cups. Detailed patterning on the coins, which often have red centres. Ace of coins: central coin with ribboned crown above, olive and palm branches below. also anonymous Belgian and Chinese (all 20th century). bottom row: Fournier, Vitoria, 20th century.